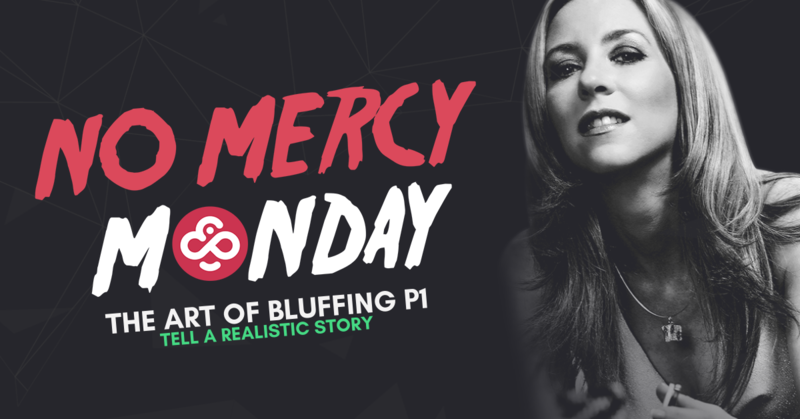 In this strategy series, CoinPoker’s Chief Community Manager and pro poker player Isabelle “No Mercy” Mercier walks you through the basics of the game. Each No Mercy Monday comes with expert advice on how to play, and it all starts with starting hands. Knowing how to play your starting hands and taking advantage of position are two essential concepts in No Limit Hold’em Poker strategy. After covering these topics extensively over the past few weeks, it’s time to cover what is arguably the most exciting aspect of poker strategy: the art of bluffing. First things first, you have to realize that while playing poker, you are continuously bluffing. It’s an act of deception, and regardless of whether you are holding a great hand or complete air, you will always try to lie about the real strength of your hand. If you are weak, you will try to show strength in order to win the pot by enticing your opponents to fold. And if you hold the nuts, you will try to show weakness in order to get called. But let’s not forget the most important aspect of bluffing: it is a story that you are telling and it has to make sense. This means that your actions since the start of the hand have to be coherent with the hand that you are trying to represent. If you are on the river and you want your opponent to believe that you are holding a pair of Aces, you have to make sure that you acted accordingly before the flop. It will be really hard to successfully convince your opponent if you did not raise or re-raise before the flop. Similarly, if you are trying to represent a nut straight that you completed on the river with a hand like 10-7 or 8-5, but you did a 3-bet or 4-bet before the flop, your opponent will most likely not believe you and will call your bet if he holds anything decent. It is indeed difficult to imagine that you would have made such raises pre-flop with hands like 10-7 or 8-5. Always remember that the story you are trying to tell has to make sense, and all of your pre-flop actions have to match the hand you are trying to represent. Also, don’t forget to join me twice a week in the Hubble Bubble tournaments to practice your skills and try to win my 5000 CHP bounty!